​35 years ago - Selma Tolon is born in Turkey. ​17 years ago - 18-year-old Selma goes to college. ​13 years ago - 22-year-old Selma starts medical school. ​9 years ago - 26-year-old Selma finishes med school & joins the Red Crescent, a disaster relief group. 7 years ago - 28-year-old Selma falls into a buried reliquary that was exposed by an earthquake during a recovery mission. She discovers the Scimitar of Sultan Suleiman the Great & the Eternity Book. She begins to study the spells & wield them in defense of the people of Turkey as Janissary. She battles Morgaine Le Fay for control of the Eternity Book, earning the right to weild it. ​​1 year ago - 34-year-old Selma joins the Global Guardians, representing Turkey when they take stewardship of Superbia. 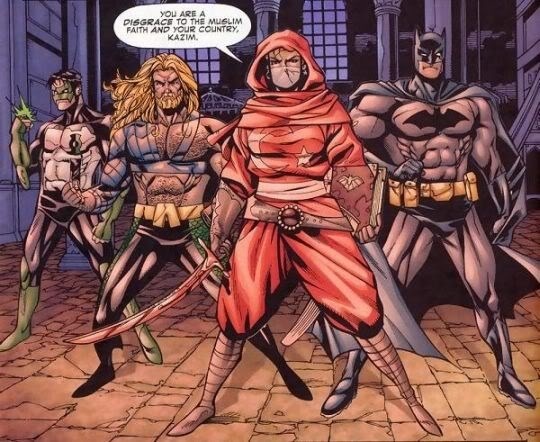 Janissary was one of the characters created for Planet DC, a series of annual issues created in 2000 to introduce new international heroes. Some were better than others, but at best they became recurring background characters. 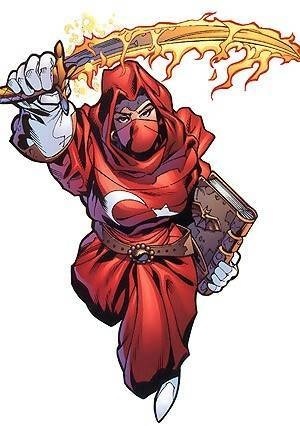 Janissary, for example, had appeared in 10 individual comics total, ever. Which is a downright shame, because she's a really great character. A Turkish doctor, a relief worker, and a Muslim, she's a really great combination of characteristics before you even get to her powers. Her design is unique and looks really cool, and she has a fantastic selection of powers. If there's any character that deserves to have a broader profile, it's her. As an international hero, she's a great fit for the Global Guardians. We made her a later addition, because the team has a lot of activity early in it's development, and an adventure in Turkey where they meet this awesome hero and bring her into their membership would make a cool story for the team.